Sleeps 8-9 (2 bedrooms, one with a double bed and a single bed on top and second bedroom with 2 sets of bunks three high. Our Clearwater Lodge is situated overlooking Lake Clearwater with Lake Camp only 5 minutes walk away. Other lakes in close vicinity are Lake Heron, Lake Emma, Lake Roundabout and also the Maori Lakes. The layout is an open plan lounge, dining – kitchen area with the bedrooms adjoining. The main room has a gas fridge, a log burner and a full sized gas oven with a four ring hob on top. This open plan room has ranch slider out on to a large deck which has magnificent views of the lake and mountains beyond. A hooded BBQ makes this an ideal spot for al fresco dining. In a separate building behind the lodge is our ablution block which houses a shower, vanity, flush toilet and a urinal. There is no electricity at Clearwater, but the lodge has a solar panel, which combined with a bank of batteries, and an inverter provides sufficient power to run the water pump, and provide lighting. Leave your hair dryer at home as there are no 230 volt power outlets, but you can run a radio connected to a 12 volt outlet near the inverter (connection by 12 volt socket). 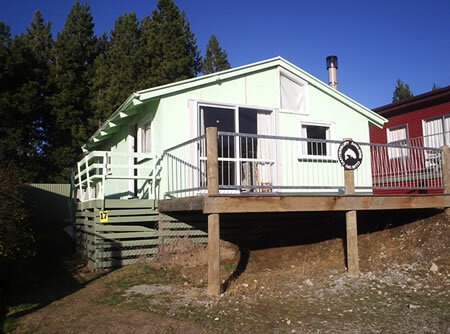 Our lodge is situated at 17 Mount Guy Road and it takes about 2 hours to drive from Hornby. The road is sealed to Hakatere which is 12 minutes from Clearwater. Hut rules etc. : Refer to notices and information folder in the lodge for hut rules, water requirements, location of community fire fighting equipment and key etc, and the location of dumpster bins for rubbish. Phone: Nearest telephone in case of emergency is by the cattle stop near the top end of Mt Guy St. There is no cell-phone coverage at Lake Clearwater. Nearest shop/garage: Mt Somers – 30 minutes away. Nearest restaurant: Mt Somers Pub. 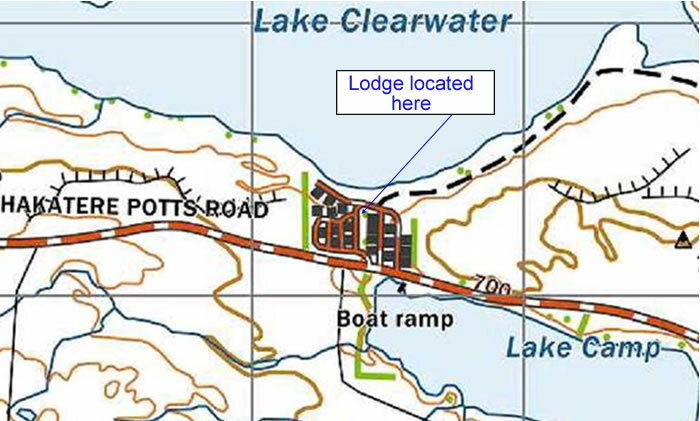 Lodge Address: # 17 Mt Guy St, Lake Clearwater Settlement. Veer to the right just prior to the cattle stop, on the Hakatere/ Mt Potts Rd (actually the 3rd right into the settlement), then right again down Mt Guy St. Clearwater is some 1-3/4 hours drive from Hornby. The road is sealed to Hakatere 10 km, or about 12 minutes from Clearwater. There are maps of the area on the wall of the lodge. Note: – No dogs allowed at Clearwater settlement. – Do not burn coal on the wood burner – it will damage it.